Mad About Ewe’s 10th Annual Retreat!! 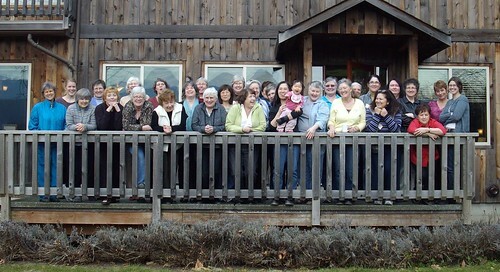 We at Mad About Ewe have been having a retreat every year for the last 9 years! And the 10th is on its way! The Retreat has been held at the Kiwi Cove Lodge for the last 5 years and is going to be there for this next retreat as well. Kiwi Cove Lodge is outside of Ladysmith, between Nanaimo and Ladysmith and is right on the ocean with Kiwi Orchards between the water and the lodge, a beautiful location. The rooms are large and comfortable. Shared accomodation only. The Retreat is usually around the end of January, beginning of February and lasts a full weekend, starting on Friday evening and lasting through to about 3:00pm Sunday afternoon. This year the Retreat is the last week-end of January – Jan, 29, 30 and 31. Last year at the retreat we learned fair-isle techniques, circular knitting and 3-dimensional embellishments, with tea-cosies as the project. This year the project is a pair of toe-up socks, DK weight so that they will knit up fairly quickly. We will covering toe-up cast-ons, two types, intarsia in the round, twisted stitch cables, fair-isle, afterthought heel, picot-cast-off. There will be three patterns to choose from. One for less experienced knitters, one for intermediate knitters and one full on, with every technique included, to challenge the experienced knitter. If you are interested in learning more, please contact us at Mad About Ewe, 1-250-754-0785, or E-mail us at madaboutewe@telus.net or contact us through the website. A Full on Technique Loaded Sock!